Our manufactured metal corrugated flexible hose has been specifically manufactured to work with great amount of accuracy in it's application. Our product is cost effective, long lasting & durable in nature. We manufacture & offer a wide range of corrugated flexible hose and wire braiding in authentic stainless steel grades 304, 304L, 321, 316L and 316Ti. 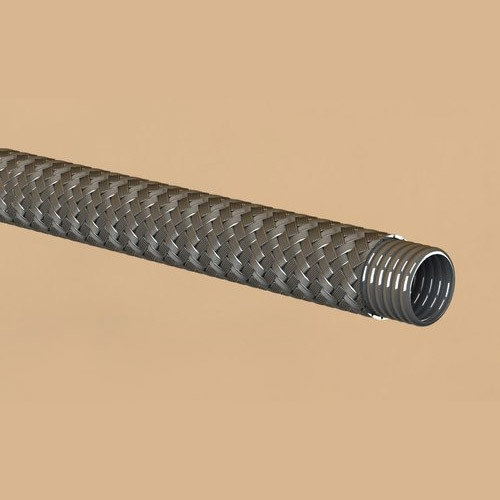 We also cater to various requirements through our customized products of stainless steel hose in flexibility class A, B and C in sizes 1/4" (6mm) to 12" (300mm). We are well equipped to specifically design and manufacture metal hose of much higher pressure ratings with increased wall thickness of tube and special braidings. Hydraulic forming process is used in the production of all hose sizes above 15mm. Alfa is engaged in the manufacturing of 2-Ply hoses with single, or multi-ply braids for special & specific applications, where high temperature and high pressure is required. Suitable for wide temperature range (-270 ºC to 700ºC). It compensates for thermal expansion or contraction in piping system. Resistant to abrasion, penetration and damage. Absorbs or dampers vibration and noise from pumps, compressors, engines and similar Equipment. Connects moving parts of machinery and equipment. Permits a very economical installation against rigid piping in difficult locations.